Posted on October 8, 2015 at 11:56 pm. The future of online gambling has well and truly arrived, as Slots Million unveils its hugely anticipated virtual reality 3D online casino. This is the Internet’s first VR/3D real money casino and we couldn’t have imagined a better venue to pull it off such with impeccable style. There’s no limit to how many tickets you can receive, so the more you deposit the higher your chances of winning a pair of these incredible virtual reality glasses. Using the Oculus Rift glasses allows you to experience online real money gambling like never before, transporting you to a crazy new world of total virtual reality. You’ll be able to walk the aisles of the Slots Million gaming lounge, sit down at the pokies machine you wish to play and immerse yourself in a gaming experience you could barely dream was possible. Don’t fret if you don’t have access to a pair of these glasses; desktop users can still enjoy the virtual reality casino in full 3D mode. The casino recognises whether or not you have the Oculus Rift glasses installed on your computer, so without the goggles you’ll automatically be redirected to the 3D casino. To access this incredible new gaming room, head to Slots Million, click on the Virtual Reality tab and download the app (you’ll need Windows 7 or 8 to access the software). Once you have the app, simply sign in using your usual Slots Million account details, or you can choose enter as a guest if you just want to play for free. You’ll get to choose an avatar that will be seen by other players in the VR lounge and can walk around and interact with others, adding a fun social element to online gambling. Rest assured that once you sit down to play a game, no other players can see your game screen or will be able to interrupt your play. The Slots Million Virtual Reality casino has over 40 of the most popular slot games available including favourite titles like Dracula, Gonzo’s Quest, Blood Suckers, Jack Hammer, Jack and the Beanstalk, Scarface, Starburst, Steam Tower, Twin Spin, Foxin’ Wins and many more. 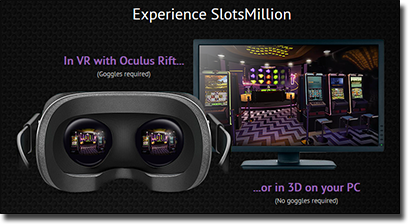 To experience this exciting new world of real money casino gaming and get your name in the draw to win a pair of Oculus Rift goggles, head to SlotsMillion.com today and make a deposit for your chance to win.